Shopping for one can be a challenge. The following tips should make shopping easier and may also save you money. Make a shopping list. Check your cupboards and fridge. Think ahead about the week's meals so you know what to buy. Organise your shopping list in the same way the supermarket is laid out. This will save you time and energy while shopping. Avoid busy shopping times. Shop when you know the supermarket is going to be quieter. Sunday afternoons, Mondays and early mornings are often less busy. Don't shop when you are hungry. Hungry people are more likely to buy unhealthy food and spend more money. Compare prices. Most supermarkets display unit prices (price per 100 g or 100 ml) on the shelf below the food. These can help you work out which brand or size package is the cheapest. Bigger sizes don't always have the cheapest unit price. Even if bigger sizes are cheaper, the saving won't be worth it if you end up throwing some away because it goes off. Buy the size that is right for you. If you only need small amounts of dry foods such as cereals, rice, dried fruit, and nuts, it may cheaper to buy them from the bulk bins. Foods from the bulk bins are usually cheaper but not always. Check the best before or use by dates to make sure the food won't spoil before you can eat it. 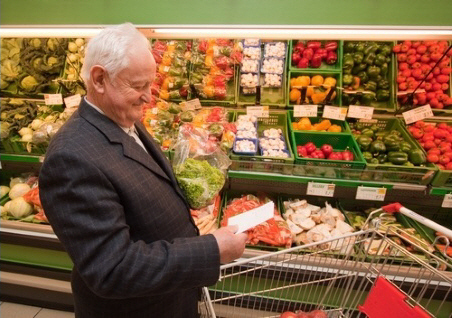 Ask the supermarket staff to help lift your groceries into your car or ask if they do home delivery. Shop online for home delivery. There's likely to be a delivery charge. If you walk to the shops, take a shopping basket with wheels. Take a family member or friend to help with shopping and transport. Having a good store of non-perishable foods and some frozen foods is a big help, especially if you can't get out to the shops because of bad weather or if you are unwell. You can create quick and nutritious meals with just a few basic items. Non-perishable foods will last a long time on the shelf, but it is a good idea to use and replace them occasionally. Use foods in the freezer within two to three months. Store dry foods in sealed, airtight containers to keep them fresh. You can make many meals out of basics like flour, rolled oats, rice, pasta and sago. Choose high-fibre breakfast cereals such as Weet-Bix and wholegrain oats. Keep a selection of cereals on hand to make breakfast interesting. Top crackers with cheese, tomato, avocado, pickles, or hard-boiled eggs for a quick snack. Rice risotto, macaroni cheese and two-minute noodles are quick, easy meals. Keep some powdered or long-life milk in case you run out of fresh milk. Once you have opened powdered milk store it in an airtight container in the fridge. Fresh milk freezes well. You can make canned food into quick, easy meals. Good examples are baked beans, spaghetti, creamed corn, fruit, and soup. Fish like tuna, salmon and sardines can also make quick, easy meals. Keep a supply of your favourite spreads for bread and toast like honey, jam, peanut butter and marmite. Keep a variety of frozen vegetables, ice cream, ready-prepared meals, crumbed fish, pies, bread rolls and sliced bread in the freezer. High-energy drinks like Complan or Vitaplan can be useful when you don't feel like cooking or eating. See Oral nutrition supplements. To save you time and energy, prepare and cook more than you need for one meal. Chill or freeze the rest in meal-sized portions. Casseroles, stews, pies, soups and sauces freeze well. So do leftover canned foods, such as baked beans, spaghetti and creamed corn. Store and reheat leftovers safely. Cover and place in the fridge or freezer within one hour. Reheat leftovers or frozen foods until piping hot. Never reheat leftovers more than once. Use refrigerated leftovers within two days and, if in doubt, throw it out. If you find cooking for yourself a chore ask your GP or practice nurse about Senior Chef. 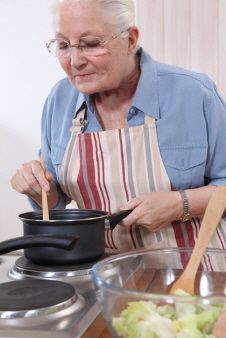 This is a free eight-week cooking class for people aged 60 and over. It helps them improve their cooking skills, confidence and motivation around cooking for one or two people. Visit the Senior Chef website for easy recipes for one or two serves. The recipes are also available in the Cooking for Older People cookbook. You can get this from the library or you can buy it for a small cost from Community and Public Health. If you don't feel like cooking, try a no-cook meal such as a sandwich and a milky drink, or cold meat and salad. For more ideas see Quick easy meals for older people. If you live alone, sitting down to eat by yourself every day can be difficult. But there are ways to put the fun back into eating. Start with keeping your cupboards full of nutritious foods that you enjoy. Studies show that when you eat with others you eat better. So sit down with some friends, family members or neighbours and enjoy their company while you eat. minced flavourings in a jar, such as garlic, ginger, basil, coriander, red chilli, and pesto. Written by HealthInfo clinical advisers. Last reviewed October 2018.